Sometimes a bowl of fruit is all you can get yourself to make on a Sunday morning. There are days when you just don’t want to fuss with much but need the energy to get you going. 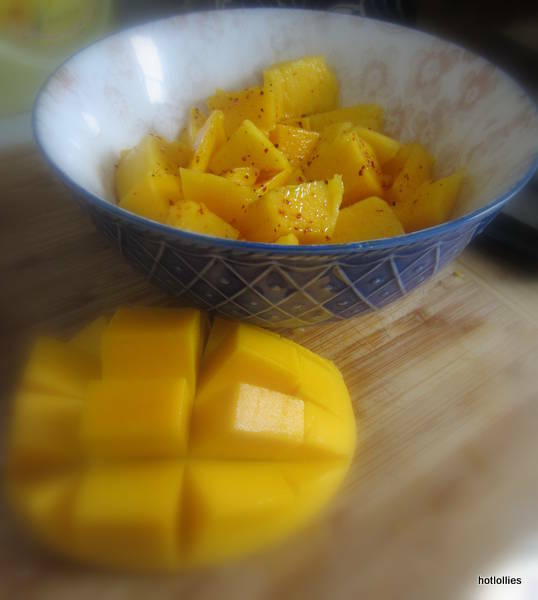 On those days a bowl of mangoes sprinkled with a little chile pepper spice is enough to fill you up and make you snap out of that sleepy mode. I’ve been using this lime infused chile pepper (tajin) like a mad woman. Sprinkling it on eggs, corn on the cob, cocktails and popsicles! Try it on a bowl of juicy, ripe mango for a nice surprise and Happy Sunday! !